Six-bar mechanisms that include a prismatic joint can be synthesized as constrained RPR chains. These single degree of freedom constrained RPR chains are capable of reaching five task positions. The synthesis process begins by first specifying a serial, open, 3 DOF chain. The inverse kinematics are solved to find five positions of the RPR that correspond to five specified task positions. Then two RR constraints are solved for as shown in the figures. The solution to the second RR constraint depends on the solution to the first. Various combinations of RR constraints provide for new design candidates to be analyzed. Below is a bolt insertion linkage that was designed using this method. A portion of this transplanting linkage was also designed using this method. M. Plecnik and J. M. McCarthy, 2013. “Dimensional synthesis of six-bar linkage as a constrained RPR chain,” New Trends in Mechanism and Machine Science, Springer Netherlands, 273-280. The six-bar linkage is the next simplest 1-DOF planar mechanism after the four-bar. However, designing these mechanisms presents a challenging set of synthesis equations. For example, a four-bar motion generator is determined by a polynomial system that has 4 isolated roots (of which one is the origin), where each root represents a potential design. On the other hand, a six-bar function generator is determined by a polynomial system that could have as many as 4.13×108 roots. Chances are the actual number of roots of this system is much smaller (by 2 or 3 magnitudes), but that number is unknown. It is much harder to find complete solution sets for general six-bar design problems than it is for four-bars. 1. More design options. As mentioned above, each root above represents a design candidate, and surely it is better to have thousands of design candidates than 3. Especially because most of these design candidates will suffer from linkage defects rendering them useless. 2. Six-bars do more complex stuff. Four-bars can move through 5, 5, and 9 positions for function, motion, and path generation, respectively. On the other hand, six-bars can move through 11, 8, and 15 positions. The maximum degree of the curve traced by a point on the coupler link of a four-bar versus a six-bar is 6 to 18. Six-bars have even been designed that can perform 2:1 gear ratios. 3. You can put things where they need to be. That is there is much more design freedom shaping links and choosing the locations of pivots. This is useful if your linkage needs to mount to specific hard points or fit within a certain envelope. Four and six-bar motion generators provide a good example. There will be a maximum of 6 four-bars that move through 5 task positions with no pivots specified. Meanwhile, there will be a maximum of 5,735 six-bars that move through 6 task positions with both ground pivots specified! Here is a bit on my research with six-bars. Six-bars are divided into 5 kinematic inversions. For simplicity, we’ll just call these types. There are three common motion requirement tasks. The table below provides a breakdown of the size of the synthesis problem for each linkage type over the three motion tasks. A hydraulic hose manufacturer in the US approached UC Irvine in order to design a linkage for their rotary weaver equipment. They were trying to equip their machines so that they could change out the current 2 over 2 braid pattern into a 3 over 3 braid pattern. 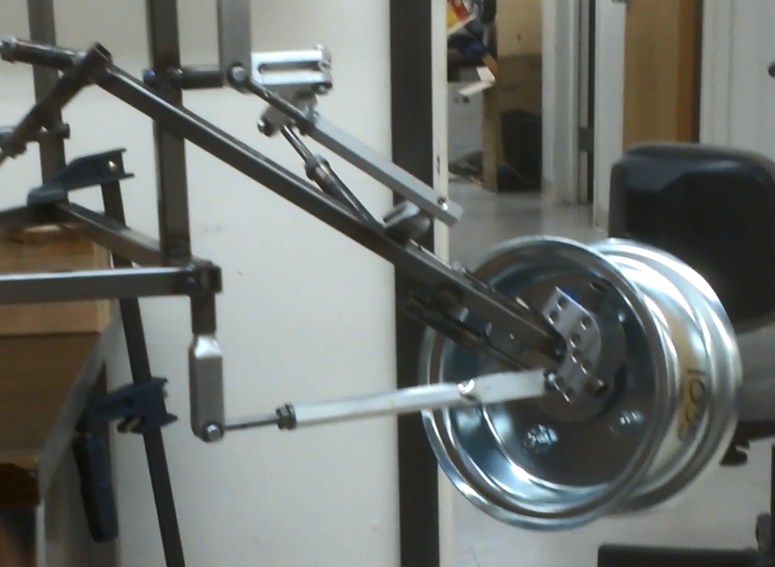 They wanted to avoid the use of cams but could not find a linkage that created a dwell motion from a constant input that wouldn’t result in the end effector hitting the spools. I designed them the following linkage that solved their problem. A wing mechanism was designed to reproduce a complex accelerative flapping gait from a single constant RPM motor. The flapping gate was deciphered from data obtained by Tobalske and Dial, 1996, of black-billed magpies. The synthesis process begins by specifying a 4R spatial serial chain that resembles a magpie’s anatomy. Moving the spatial chain through the desired flapping gait defines a function of joint angle over time at each of the four joints. A six-bar Stephenson II function generator was designed for each joint angle function and the whole system was coupled together such that it can be run by a motor spinning at constant RPM. Finally, compliant joints were added between the wrist and wing tip to mimic this portion of a bird’s anatomy. This joints utilize hard stops in order to limit their compliance to one direction creating aerodynamic check values such that control surfaces remain rigid during downstroke and deflect during backstroke. The resulting motion has a long, stretched out downstroke followed by a quick, compressed backstroke. B. W. Tobalske and K. P. Dial, “Flight Kinematics of Black-billed Magpies and Pigeons Over A Wide Range of Speeds,” The Journal of Experimental Biology, 199(2): 263-280, 1996.